The concept is simple. The mundane computer stuff you have been buying and maintaining locally (i.e. software, upgrades, data backups, etc.) could be farmed out to remote services on the Internet thereby freeing you to create, process, and save. I don’t have a separately purchased word processor on my laptop, for instance. I use Google documents and now Buzzword, too. They do almost everything I ask. For free. And the documents saved online are available anywhere I go. I seldom fuss with syncing copies or loading files to a traveling memory stick. A spare drive is handy at times but seldom crucial. No email is stored on my machine. For about $25 a year I store most of my photos on Flickr. Not all are public, but all are accessible. I can pull images from my stockpile and use them in blogs and elsewhere. I use desktop photo and video editing software now, but I’m starting to fiddle with online photo editors, too. I use my laptop more than ever, but it holds little more than music and document drafts anymore. In short, Internet utilities provide the applications, the functions, the storage, and the access for me. They also handle the endless upgrades and bug fixes. 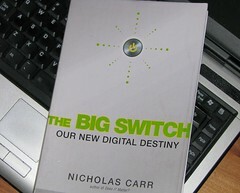 In his book, Carr compared the advent of this era with the dawn of electrical utilities. Factories in the 19th century used to generate their own power. It was part of their business. If you made textiles, you built a mill on a river and ran your looms with belts set spinning by your waterwheel. If you needed steam power, you created it. Eventually, electrical utilities took on the power hassles. They could efficiently generate electricity off-site and supply it to subscribers. Businesses went back to what they were good at and let the utilities fuss with building power grids and transmission systems. Internet utilities are starting to do the same. IT departments that occupy large portions of every organization might be increasingly freed from the hassles of upgrading hundreds of machines with each new software version or bug fix. Data backups could be automated and off-site. Scalable utility services could probably handle fluctuations in use and storage needs, too. Local IT would still need to handle hardware, troubleshooting, consulting, and parameter settings, but many of the tedious maintenance tasks could be handled by subscription. Many services are free (or low cost) to individuals now. Organizations with much greater needs would pay more for such services but utilities will likely be more efficient and less expensive than current in-house operations. Many smaller libraries already subscribe to Internet services such as workstation management and catalog support. Don’t get me wrong: It’s not all rosy. A slew of thoughts came to mind reading up on the subject. Issues relating to our data’s security [Is it backed up? How often? At different locations? How strong are the firewalls? ], availability [How reliable is it? How fast is it? Can the bandwidth handle it? How often might it go down? ], privacy [Whose property is it? Can others see it? Can the utility mine it for data? How much tinkering can we do with the parameters?] and permanence [If we delete something, is it really gone?] need to be addressed before any sane organization buys into the idea completely. These concerns are real, but the concept of Internet utilities seems more a matter of when than if. This entry was posted on Wednesday, February 27th, 2008 at 8:33 pm and is filed under blogs, concepts. You can follow any responses to this entry through the RSS 2.0 feed. You can leave a response, or trackback from your own site.